Netanyahu In Washington For Controversial Speech To Congress : The Two-Way "The move has created bad blood between Netanyahu and Obama, and relations between the two countries have suffered," NPR's Jackie Northam reports. 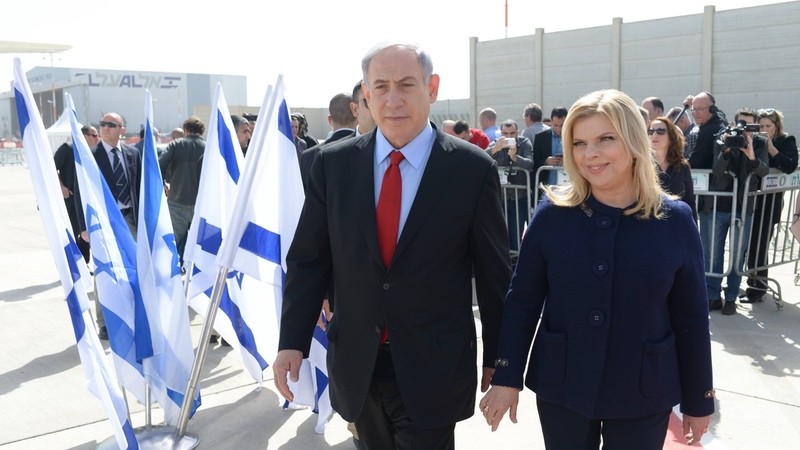 A handout image provided by the Israeli Government Press Office shows Prime Minister Benjamin Netanyahu and his wife, Sarah, leaving Tel Aviv on their way to Washington Sunday. Israeli Prime Minister Benjamin Netanyahu is in Washington, D.C., where he'll deliver a speech to Congress Tuesday — an event that's causing debate both in the U.S. and Israel. The leader's plans were made without consulting the White House; he will not meet with President Obama during the visit. Netanyahu will appear Monday morning at the annual conference of AIPAC, a powerful pro-Israeli lobby, where he's expected to urge the U.S. to impose sanctions on Iran instead of making a deal over the country's nuclear ambitions. You can follow the prime minister's speech at the AIPAC conference in a separate post by the Two-Way's Krishnadev Calamur. A sample: "Never has so much been written about a speech that hasn't been given," he said of his address to Congress. "Normally the AIPAC conference is an opportunity for the White House to publicly support Israel and its leaders," NPR's Jackie Northam reports for Morning Edition. "But this year, it wasn't clear it was going to send anyone. It was only at the last minute that it was announced two administration officials would attend." Those officials include National Security Adviser Susan Rice, who said last week that Netanyahu's speech is "destructive to the fabric of U.S.-Israeli ties." March 17 — Israel will hold parliament elections, in a tight campaign year. March 31 — A deadline arrives in the U.S.-led negotiations over Iran's nuclear program. Netanyahu was invited to address Congress by House Speaker John Boehner, in a move that didn't include Democrats. The plan has also rankled the Obama administration because it breaks with a U.S. policy of not hosting foreign leaders who are about to face an election. "The move has created bad blood between Netanyahu and Obama, and relations between the two countries have suffered," Jackie reports. -- "According to the signs, in most of the U.S., there is support for Israel. So I can have differences with the U.S. president, that is legitimate, so what is not legitimate about us speaking our minds? Especially when the majority supports us," Netanyahu said Friday, according to Jerusalem Post. -- "We don't want to see this turned into some great political football," Secretary of State John Kerry said on ABC's Sunday program, This Week. -- In Israel, a group called the Commanders for Israel's Security "warned that Netanyahu's upcoming speech to Congress is a clear and present danger to the strategic alliance between the U.S. and Israel, and actually helps Iran," reports Israel's Ynet News. -- "The more the White House criticizes Netanyahu, the more votes he gets from the right, and to a certain extent, from the center." Israeli professor Eytan Gilboa, quoted by Politico. "More than two dozen Democratic members of Congress, in addition to GOP Rep. Walter Jones (N.C.), have publicly pledged to skip the speech," The Hill reports. "Don't lose focus. The bad guy is Iran," Sen. Ben Cardin, D-Md., told an AIPAC audience Sunday. "We can never allow Israel to become a political wedge issue."